I’m writing this story based on recollection as I wasn’t keeping detailed records back in the day as I do now. 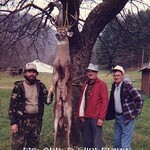 I had started turkey hunting in the early 80s & only hunted WV. I had a camp on the Birch River in Webster County in the middle of coal country. The area is very mountainous making hunting difficult at best. 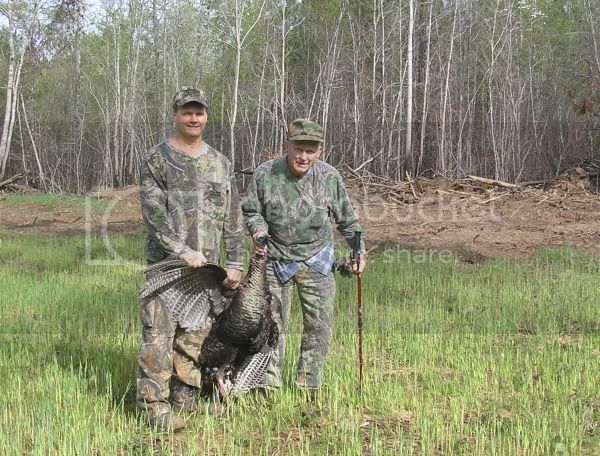 Those of you familiar with turkey hunting in WV generally & Webster County specifically know that birds were few & far between & any turkey killed was well earned. During the opening week of the 1991 season, I had hunted several different areas with absolutely no luck. Towards the end of the week, I decided to hunt the mountain behind a friends place & above an old cemetery. I had seen birds in the general area & hoped I could finally sweet talk 1. Well before daylight, I walked about ¾ the way up the mountain along the woods edge & old fence row before moving into the woods several hundred yards. Starting shortly before daybreak, I called off & on for a couple of hours with no response at all. Sometime around mid-morning, I decided to try the Knight & Hale Fighting Purrs as nothing else was working. After running 3-4 “fights” over an hour or so, I spotted several birds working down the mountain towards me. I managed to set the calls down & get the 1100 up on my knee without getting spotted. They got within 30 yards or so & I found 1 with a beard. When it was in the clear, I dropped it. Before I could get up, the turkey got to its feet & I hit it again. This time it stayed down but did start to flop, a lot. I removed the last shell but, but it was flopping so much that, before I could get to him, he started to roll down the mountain. I started running after it with my left arm windmilling to keep me upright & holding the shot gun in my right hand. I was loosing ground but the bird finally rolled into a tree & stopped. We were almost at the bottom of the mountain. After tagging the bird, a jake with a 6 ½” thick beard, I headed back up the mountain to get my seat, calls, & other odds & ends. Problem was, I couldn’t find where I had been sitting. I went back down & up again & still couldn’t find my stuff. I went back down the mountain for the 3rd time but this time went to the fence, retracing my steps from that morning. I walked directly to where I was sitting. Too bad I didn’t do that the 1st time I went looking. 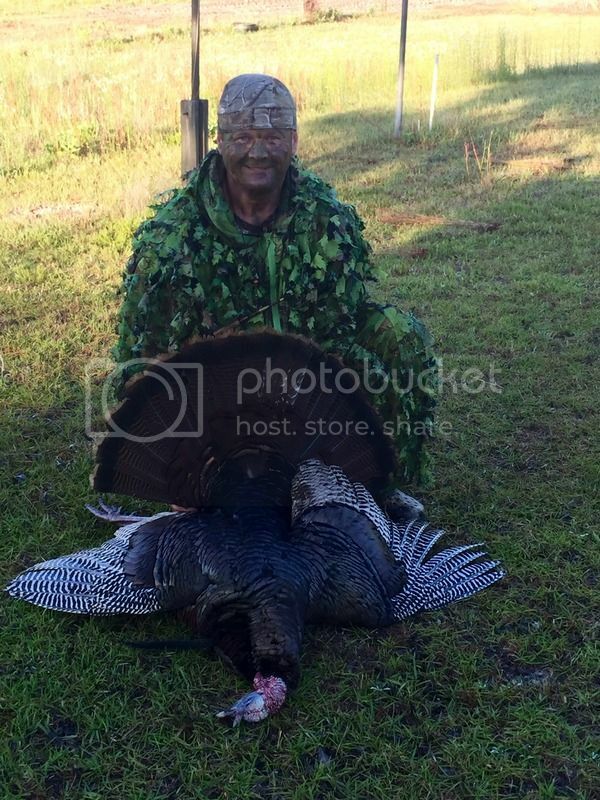 This was the 1st of many birds & even more hunts & was definitely a fire-starter!! Nice story. Nothing like that first one. I can remember mine like it was yesterday. And I don't know why, but to this day after a kill I think about that first one. He says, "Well he don't say nothin cuz he's dead"
"And I'd like to shoot you again"
He says, "He still don't say nothin cuz he's still dead"
It seems like I remember the misses more than the kills. Maybe because they are fewer than the kills. ROTFLMAO!!!! Last edited by soiltester on July 23rd, 2016, 7:30 am, edited 1 time in total. I still have the camera I used back in the day, an Olympus Stylus Zoom All Weather 35mm. It's smaller than the palm of my hand & was a lot easier to carry around. The pic of me & the bird was taken with it but the other 2 were with either my Canon A1 35 or Canon 40D digital. Actually, I hadn't written the story up before. I just sat down the other day & put my rememberer to work. I need to try to do that with some other hunts I didn't write up. Those 1st birds are special. You need to write up the story before your rememberer quits on ya. I had to choke em' cause I chased him down in the woods .. remember?? OH and re-read the date, as it was my typo and is 5 of 1975!! soiltester wrote: I had to choke em' cause I chased him down in the woods .. remember?? Soooooooooooooo, You're rememberer is already shot!!!! We always choked the ducks & geese we shot by the necks or held them by the feet and did turkeys also.. sometimes would spread the wings and 2 would hold it so the fan would show a natural partially fanned. That 2nd pic with your Dad is great. I think we all know why you had such a big smile on your face in the last pic. HunterGKS wrote: That 2nd pic with your Dad is great. I remember my first like it was yesterday. Early 80s, I was 20, riding on the back of a Honda 4 wheeler deep in the hardwood mountains on the TN/AL border. I was offered to use a buddies custom Turkey shoot Rem 870, that his father had left to him. Beautiful custom stock, with special 32" barrel. 2 3/4" AA hull, loaded with lots of Blue Dot, a red AA wad, and 1 1/8oz of CP 4s. Heading to a new location, when we rounded a bend, and there were a flock of a dozen, with two big strutters. Maybe 40 yds. Big Brother was doing the driving, and had his gun in the case. I didn't even blink.... Boof!! Never did that again, but I was proud of my first just the same. I remember the second even more, which happened a week later, within a quarter mile of the first. Sucker gobbled at a Dove cooing. It was drizzling rain, but quiet. Buddy had gave a camo head cover. Looked exactly like a clan mask, with the pointed top and everything. I yelped on my Quaker Boy Old boss hen, and he gobbled like a big Boss right down the hollow from me. I then heard, Bok, Bok, and all this thrashing. Before I knew what was happening, I see him flying in hitting the ground on a dead run. I hit the ground, and tried to hide behind a sawed off stump. I try to get the gun up on the stump, and slip and fall over, and roll to the side of the stump. When I get the gun back up to shoot, the dang mask had turned sideways. By the time I get the eye holes lined back up, the turkey is looking at me at 30 yds, wondering WTF is this thing rolling around on the ground. He musta been hungry is all I gotta say. 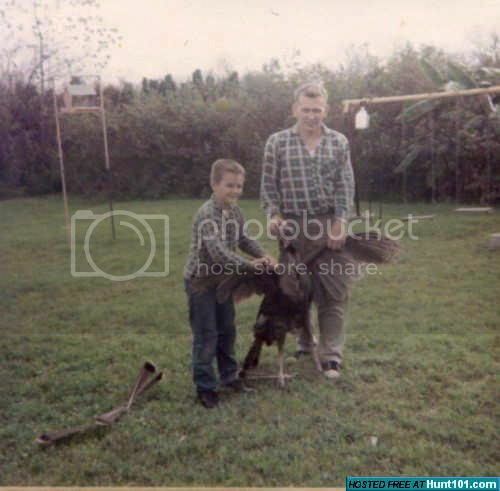 1969 – First Day PA fall turkey season – I was 14, Dad and I started the day hunting rabbits. With me playing the part of the dog; mid- morning we’d relocated to another farm, and ran into a buddy of his. They had just broken a flock of turkeys, and as we were getting the details, a B-52 went flying over – Dad emptied his 12 gauge – 3 shots; I assisted with the one shot from my 20 gauge. One of us hit it, OK we all know it weren’t me! We followed to a clear cut where Dad was sure it landed; split up to try and flush it – I spied 14 Lb Jake sitting in a brush pile; before he could get out, dispatched him. Last time I ever hunted rabbits. 1973- 2nd year of Spring Gobbler Hunting for me. First day of PA Season –had this fancy new caller from PA legend. DDAdams – with no idea what to do with the call or how to hunt them. Working my way up the spur when 2 birds started Gobbling; Gave them the best contest callin’ they’d ever heard. Ran the call a couple times making noises, can’t call them yelps, cackles, or any other turkey sound. One flew away, one flew toward me, landed just down over a bank and ran up and into a 2 ¾ “ load of #2 shot. Thick long beard, 11+ inches and 20+ lbs – we ate him at a family gathering Sunday after Church.